18. Thomas H. Piercy. Son of Matthew Piercy & Agnes Moffitt. Born 29 Aug 1838 in Harvey, NB. Died 11 Dec 1904 in Denman Island, B.C. From New Brunswick Reporter, Fredericton, 15 Mar 1867: "Married Waverley House, 11th inst., by Rev. Dr. Brooke, Thos H. Piercy and Miss Jane Speedy, both of Manners Sutton, York Co."
Witnesses to marriage were Will McMillan and Margaret Piercy. Thomas and Jane with their oldest four children, moved to Gartley Beach on Vancouver Island, British Columbia in 1875 with other members of the Piercy family. They spent the first winter with the Gartley family and then moved to a little place called Beechams on the east of the Back Road. From there they moved to the Muster's place and shared a large frame house with the families of Sam, Matt, and John Piercy. The Tom Piercy family moved to Denman Island after several years pre-empting a tract of land on the west side of the island. John Piercy pre-empted the adjoining section. The Piercy children walked four miles through dense forest to attend school. In 1883 they moved back to Comox to be nearer relatives and school. In 1888 they returned to Denman. Tom was a true pioneer of Denman being the first Justice of the Peace and first road foreman. He was involved in planning improvements for roads, school, church and logging. He also tended the lighthouse at Yellow Rock. In 1902 he was appointed Postmaster and the post office was in their home. Harvey Station (York Co.) Oct 15 -- Amongst our latest arrivals are Mr and Mrs Thomas Piercy of Nanaimo, BC. Mr and Mrs Piercy were formerly residents of this place and took up their abode in the west twenty years ago. He married Jane Speedy, daughter of Thomas Speedy & Isabella Patterson, 11 Mar 1867 in Waverley House, Fredericton By Rev. Dr. John M. Brooke . Born 7 Sep 1846 in Harvey. Christen 25 Oct 1846 in Harvey By Rev. Daniel McCurdy. Died 29 Mar 1939 in Denman Island, B.C. Jane and her husband Thomas H. Piercy moved to British Columbia in 1875. The oldest four of their eleven children were born in N.B. Further information on this family in "A Family Tree - Piercy - 1814-1979" Printed by Copy Cat Graphics Inc., Courtenay, B.C. 2881. 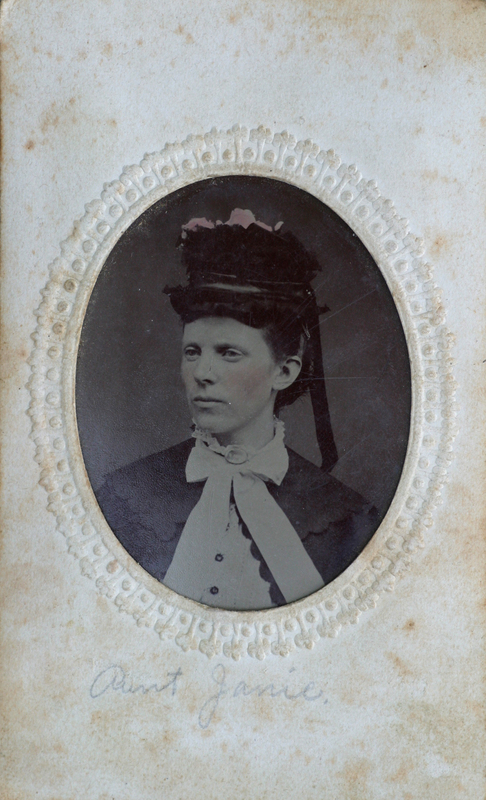 Undated tintype image of "Aunt Janie" Jane 'Janie' (Speedy) Piercy (1846-1939). Source: Darrell Messer, Harvey, Rephotographed by Tim Patterson. 26 Jul 2007.